We all love to keep our cars clean. However, sometimes mother nature does it for us! After all, rain is nature's car wash, right? Well, not exactly. Rain can be acidic which may cause damage to your vehicle's paint or body over time. Rain can also bring harmful pollutants or particulates which can stain or damage the vehicle's surface. Of course, rain isn't ALL bad! A crisp Michigan rainfall can help wash away superficial stains from the vehicle's surface. That family of birds at it again? A rainfall can wash away the evidence. Pollen and dirt? Rain can help get rid of that as well. To be clear: The potential "damage" from rainfall is minimal. However, just because the car doesn't melt immediately following a storm doesn't mean there isn't danger. 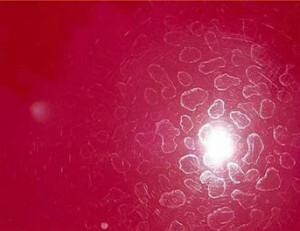 Over time, acid rain can etch its way into the vehicle surface and cause defects in the vehicle's paint. Once acid rain causes this type of damage, getting rid of it can be a time-consuming and costly process. Just because this doesn't happen immediately, doesn't mean that it isn't happening. Even a short rainfall can drop acid rain and other contaminants on your vehicle. Once the rain dries, the water may be gone but the contaminants are left behind. Most often these effects are only visible over time. When your car starts to look like the picture above, it's too late to take preventative measures! There is nothing "wrong" about taking your car to the car wash in the rain, though it may seem counter-intuitive and counterproductive. Rain produces mud, puddles, wet roads, and more. After all, who wants to spend time and money at a car wash only to drive through a puddle of muddy water on the way home! You probably won't have to wait in line for too long at your favorite car wash! Rainy days tend to be slow in the car wash business so you can get in and out in no time. A quality car wash not only cleans your vehicle, it prepares your vehicle for adverse conditions such as rain. Rain-X, clear coat protectant, and wax can help put a layer of protection between your vehicle's surface and the elements. Over time, these products require repeated applications so they're actually most effective as soon as they're applied. Getting a car wash in the rain is therefore the most effective time to clean your vehicle and prepare it for the conditions it will immediately encounter. Of course, getting a car wash in the rain still seems like a waste of time and money. A better idea may be to get your car washed the day AFTER a rainfall. This will clean your vehicle of harmful elements the rain may have brought with it. At the same time, a quality wash that includes vehicle body protectants will ensure you're ready for the next time mother nature comes rumbling!